Steve Ballmer has decided to retire from Microsoft — I’m sure it wasn’t voluntary. Many investors have long sought his resignation because Microsoft’s stock performance has lagged for a long time. In the last five years, Microsoft’s stock price is up about 25% while Apple’s is up 183% — 25% vs 183%. It’s long past the time for Ballmer to go. I’d like to take a closer look at the strengths and weaknesses of the two companies and offer my opinion of why Microsoft has stagnated. It can’t all be blamed on Ballmer but he shoulders much of the responsibility. Apple has gone through some difficult times over the years but has been on a tear lately. They are clearly doing something right. Apple’s core strength has always been in consumer markets. They’ve done well targeting individual buyers and catering to their needs. iMacs, iPods, iPhones and iPads are in homes around the world. Businesses have been pushed to support Apple’s devices simply because they are so popular with consumers. Apple has some enterprise products anchored by their OS X Server. The primary function of OS X Server is managing OS X and iOS devices. No company buys OS X Server for the standalone value it offers — there isn’t much. Microsoft has a much broader product line — many enterprise server products, many consumer desktop products, Windows Phone, the XBox, Skype and Bing. Their strategy is much closer to being “all things to all people” but it leaves me wondering about their core strength. What are they really good at? By any measure, they’ve had great success in enterprise markets with products like Windows Server, Exchange Server, SQL Server, SharePoint and Office. Every major company around the world uses one or more of these products. In the consumer space, their results are mixed. Most consumers buy computers running Windows through companies like Dell, HP and Lenovo. Many also purchase Microsoft Office simply because they use it at work. Conversely, Windows Phone and its predecessors have failed. Microsoft desperately wants to penetrate the tablet market too, but so far without success. Windows RT and Windows 8 on tablets haven’t generated consumer excitement. The Xbox has done well and so has Skype (which Microsoft acquired) while Bing has gone nowhere. Their consumer products are a mixed bag. Where has Microsoft gone wrong in the consumer space? To me, it’s simple — they tried to bring the Windows desktop to mobile markets. Most consumers don’t want Windows on their phones and tablets. It’s too big and too complex. They want simple-to-use mobile devices. It appears that Microsoft has finally figured that out but it may be too late. What should Microsoft do now? That’s a question many people inside and outside the company are trying to answer. I strongly believe that they should focus on their strengths. They’ve had great success in enterprise computing and I believe they should focus there. They can bring much more value to that space simply because big enterprise companies are struggling with a plethora of devices and technologies, including open source. Microsoft is in a unique position to seamlessly integrate it all. How do Windows Phone, Windows RT, Xbox, Skype and Bing fit in? I’m not sure that they do. 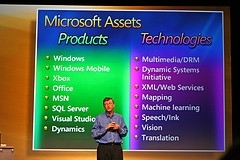 It may be time for Microsoft to abandon or sell off those assets. It can use the cash and people to focus on its strengths and generate higher returns.